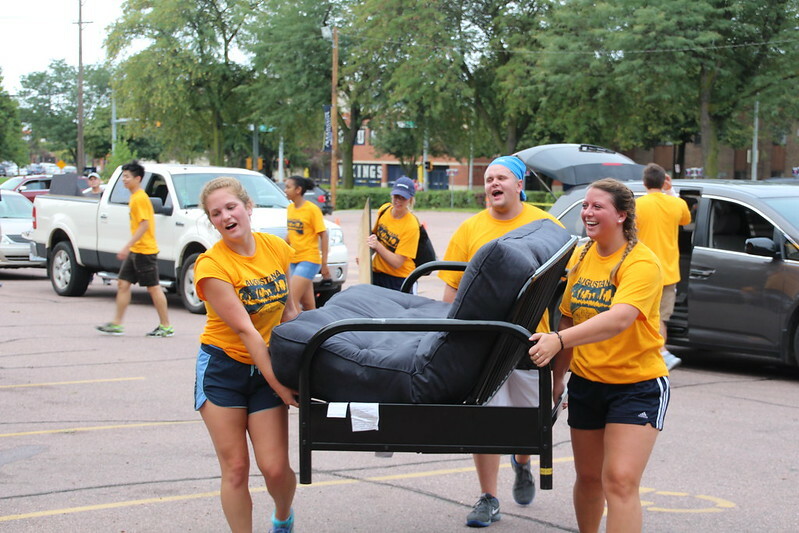 The voyage begins today for Augustana's newest Vikings. Arriving from 20 states and 10 countries, members of the Augustana University Class of 2021 arrived on campus Saturday morning. Read President Herseth Sandlin's welcome message to students. Waiting to help them officially board the ship and navigate their new home were dozens of Augustana Viking Guides — enthusiastic upperclassmen clad in yellow T-shirts, on hand to help carry futons, plastic tubs, rolls of carpet and more to rooms inside Bergsaker, Solberg and Tuve residence halls. As they unpacked and settled in, the new Vikings were already showing creative ways to make their new rooms feel like home. Roman Pham and Hank Freese are roommates in Solberg Hall. Pham, a pre-med biology major, and Freese, a pre-dental biology major, are from Sioux Falls and both attended O'Gorman High School. By mid-morning Saturday, a small basketball hoop was assembled and ready inside their room. Across campus, Jenna Bartunek (Brooklyn Park, Minnesota) and Lara Thiem (Omaha, Nebraska) are roommates inside Endeavor, Augustana's newest living community centered on vocation and located inside Tuve Hall. Their room features bright bedding and coordinating baskets in an aqua, gray and white color scheme. Thiem said she was drawn to Endeavor because of its focus on community. "I think we're all going to be really close," she said. Additional move-in day activities on Saturday feature a Welcome Week Premiere, a picnic with President Stephanie Herseth Sandlin, an Opening Night event at the Elmen Center and a bonfire on the Campus Green. Augustana's newest Vikings will see the 2017-18 academic year open at Opening Convocation on Tuesday, Aug. 29. Classes begin on Wednesday, Aug. 30.